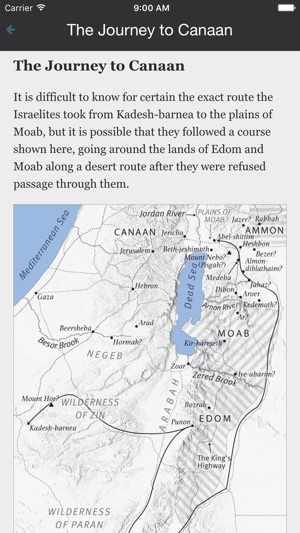 As much as I love the notes of the MacArthur Study Bible, and also much of the look of the layout, I have the same repeated continual problem as I saw at least some others have. Every time I use the app, at some point if I’m reading for long, the app freezes and won’t move; and then when it finally unfreezes, it jumps to the last chapter of Revelation. This generally causes me to switch to a different Bible app bc of the time delay involved, so I generally just defer to a different Bible app to begin with. 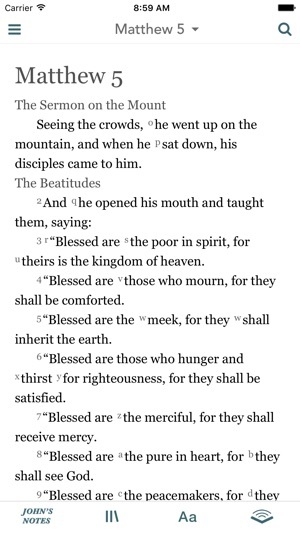 Also while I’m on the subject, the other little annoyance is in the switching from one scripture location to another. It takes maybe two or three taps on the scripture address to get it to allow you to search another address. 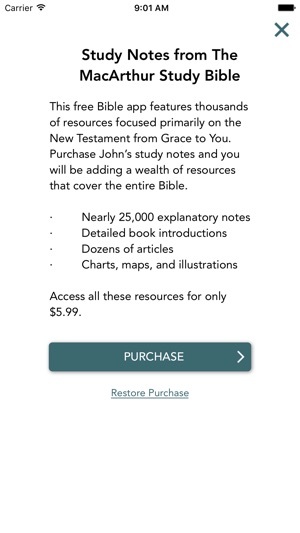 I know this can be fixed because the YouVersion app used to do the same thing and they finally fixed that with an update. It was a huge fix. And a little tiny thing is that having to select Old or New Testament is just another unnecessary step that requires an additional click. You can designate the move from Old to New without actually requiring us to select it. Also the Headings for new sections in the middle of books are not in bold and look like part of the text. One example is in the middle of verse 8 of 2 Samuel 19. There is a paragraph switch with a heading title that looks exactly like the rest of the text just stuck right in the middle of the verse. I do most of my deeper studying through this app. There are many things to like about it. For one you have great notes from John MacArthur available with just pressing on the scripture. Then when you do so you can easily go right back to where you left off. You can also directly route to reference scriptures and when you are done looking at a reference scripture you can go right back to the last thing you were reading. 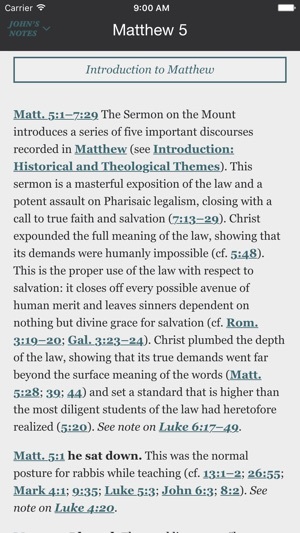 Makes for very smooth and quick scripture referencing. Also the colors of letters and background can be changed. Well the background can change from sepia to grey to black. I prefer black with Jesus words in red. Also there are many Recources such as daily bible which allows you to go through entire bible in one year while reading 4 different books at once. There are daily devotionals. Each book has an eleborate introduction. 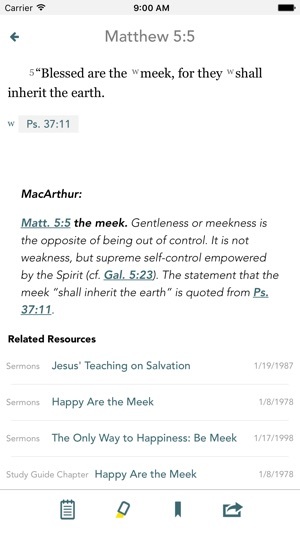 MacArthur sermons are available that apply to scripture that you’re reading. It also has audio if you like that. There are also writings from other people in there that apply to the scripture. I love it. As an older Christian woman who has learned to overcome sexual abuse through the word of God and find victory in Christ, realizing that we are more than conquerors through him who loved us, God has called me to teach younger women how to live and walk in victory. Other than the Bible, STUDY BIBLE as well as GRACE TO YOU with John MacArthur, are my primary reliable sources for sound doctrine. Many women in today’s world, not only young women, are resistant to the word “submission“ because they don’t understand what God means by it. We are not to be in spiritual authority over a man in the church or in our home. In specific circumstances, we may be put in that position due to our spouse’s poor mental or physical health or his sinful unchristian ways of living. We are not commanded to be a doormat or to be abused. In order to understand the word more fully, this is an excellent source of learning for myself and teaching God‘s word to other women. I highly recommend both apps.